<h2>Extreme space weather can wreak havoc on Earth. These tools help warn of the dangers ahead </h2><br /><p>Importantly, modern scientists have something that observers decades ago did not – sophisticated satellite data and modelling that can forecast space weather with accuracy.</p> <p>‘If space weather forecasting is inaccurate…space storms can result in disruption in the operation of satellites, interruptions of communication, incorrect navigation data from GPS satellites, force the rerouting of polar flight paths, or set up ground induced currents that can severely impact the operation of power grids and pipelines,’ said Professor Robertus von Fay-Siebenburgen, who headed up a project called <a href="https://cordis.europa.eu/project/rcn/193480/en" target="_blank" rel="noopener noreferrer">PROGRESS</a> at the University of Sheffield in the UK.</p> <p>Along with other scientists, he coordinated the work to improve the reliability of systems that predict space weather events by measuring the solar wind from distances further away from Earth than previously possible.</p> <p>Solar activity follows an 11-year cycle of high and low periods. Those high periods are when it is most likely for events like coronal mass ejections (CMEs) to occur, where the sun flings off massive bulks of charged plasma into space. These charged particles, when directed towards Earth, can impact in as soon as half a day’s time. Many times the first real warning can only come an hour before.</p> <p>‘The consequences of space weather hazards can result in anything from a mild operational inconvenience to total loss of segments of our modern technological infrastructure,’ said Prof. von Fay- Siebenburgen.</p> <p>‘A worst-case scenario may cause the setback of the economy of a country even up to a decade.’</p> <p><iframe src="https://www.youtube.com/embed/YdKdJIWZVNU?controls=0" width="560" height="315" frameborder="0" allowfullscreen="allowfullscreen"></iframe></p> <p><em>Solar storms have caused sea mines on Earth to explode and unusually bright northern lights in the past. Courtesy of NASA/SDO and the AIA, EVE, and HMI science teams.</em></p> <p><strong>Improved forecasts</strong></p> <p>That’s where improved forecasts come in.</p> <p>‘If we can successfully forecast the state of the solar wind at L1 (a point between the Earth and Sun where gravitation forces are equal) based on observations of the solar disk, we can increase this forecast horizon to about one day (in a worst-case scenario),’ he said.</p> <p>One way the project did this was by using more advanced computer modelling, instead of having to wait for observed results.</p> <p>Using machine learning to sift through data, computers can predict the level of geomagnetic activity due to the interaction of the solar wind with the terrestrial magnetic field, forecasting how particles travel between the magnetic field and radiation belts.</p> <p>For instance, what effect particles cause can depend greatly on the direction of a CME’s magnetic field.</p> <p>‘Some of these particles may lose their energy to the atmosphere causing the aurora borealis/australis. Other particles can gain energy, thus posing a threat to the satellites orbiting in the vicinity of the radiation belts. Solar flares may emit intense bursts of X-rays that can penetrate deep into the ionosphere severely disrupting radio communications and navigation systems,’ Prof. von Fay- Siebenburgen said.</p> <p> <div class="quote-view quotesBlock quote_horizontal"> <div class="quotesTop"><img src="https://horizon-magazine.eu/sites/all/themes/horizon/images/quotes_top.png" alt="" title="" /></div> <p>‘A worst-case scenario (of space weather) may cause the setback of the economy of a country even up to a decade.’</p> <blockquote><p>Prof. von Fay-Siebenburgen, Solar Physics and Space Plasma Research Centre, University of Sheffield, UK</p></blockquote> <div class="quotesBottom"><img src="https://horizon-magazine.eu/sites/all/themes/horizon/images/quotes_bottom.png" alt="" title="" /></div> </div> </p> <p>He thinks that we still have a long way to go in improving forecasts, noting that a ground-based monitoring network or satellites positioned to the side of or behind the Sun relative to the Earth could lead to further improvements.</p> <p>‘These systems (ground- or space-based) would enable a reliable forecasting by up to three to five days, a lead time that the industry and other stakeholder have highly desired for a long time.’</p> <p><strong>Alternative views</strong></p> <p>Dr Richard Harrison at the Rutherford Appleton Laboratory in the UK is on a similar track. He and colleagues in a project called <a href="https://cordis.europa.eu/project/rcn/188809/factsheet/en" target="_blank" rel="noopener noreferrer">HELCATS</a>, used a satellite set up to monitor the Sun and Earth from a side view, known as <a href="http://www.stereo.rl.ac.uk/" target="_blank" rel="noopener noreferrer">STEREO</a>, to gather data on CMEs and how they vary in speed, density, and direction throughout a solar cycle.</p> <p>‘The idea was to exploit the&nbsp;<a href="http://www.stereo.rl.ac.uk/" target="_blank" rel="noopener noreferrer">STEREO</a> Heliospheric Imaging data, with observations of over 1000 CMEs from 2007 onwards, and apply the latest and best analysis and modelling techniques to investigate the identification, tracking, and prediction of CME events in the heliosphere,’ he said.</p> <p>By combining solar events seen from imaging with modelling, they were able to help improve predictions of arrival times on Earth by better understanding how CMEs interact with one another as they propagate outward from the Sun.</p> <p>‘The <a href="https://cordis.europa.eu/project/rcn/188809/factsheet/en" target="_blank" rel="noopener noreferrer">HELCATS</a> project is a resource for the research community. The catalogues will continue to be widely exploited and the assessment of the models has had a lasting impact on our approach to studies of Earth-impacting events,’ he said.</p> <p>‘Forecasting space weather is becoming more and more important and our modern technologies are far more susceptible to impacts from space weather. The threat is recognised to the extent that severe space weather is now listed on the national risk registers of many countries.’</p> <p><em>The research in this article was funded by the EU. If you liked this article, please consider sharing it on social media.</em></p> <br /> <img src=”http://www.google-analytics.com/collect?v=1&tid=UA-40077089-1&cid=extreme-space-weather-can-wreak-havoc-on-earth-these-tools-help-warn-of-the-dangers-ahead-&t=event&ec=republish&ea=read&el=extreme-space-weather-can-wreak-havoc-on-earth-these-tools-help-warn-of-the-dangers-ahead-&cs=republish&cm=republish&cn=republish&cm1=1" /> This post <a href="https://horizon-magazine.eu/article/extreme-space-weather-can-wreak-havoc-earth-these-tools-help-warn-dangers-ahead.html">Extreme space weather can wreak havoc on Earth. These tools help warn of the dangers ahead </a> was originally published on <a href="https://horizon-magazine.eu/">Horizon: the EU Research &amp; Innovation magazine | European Commission</a>. 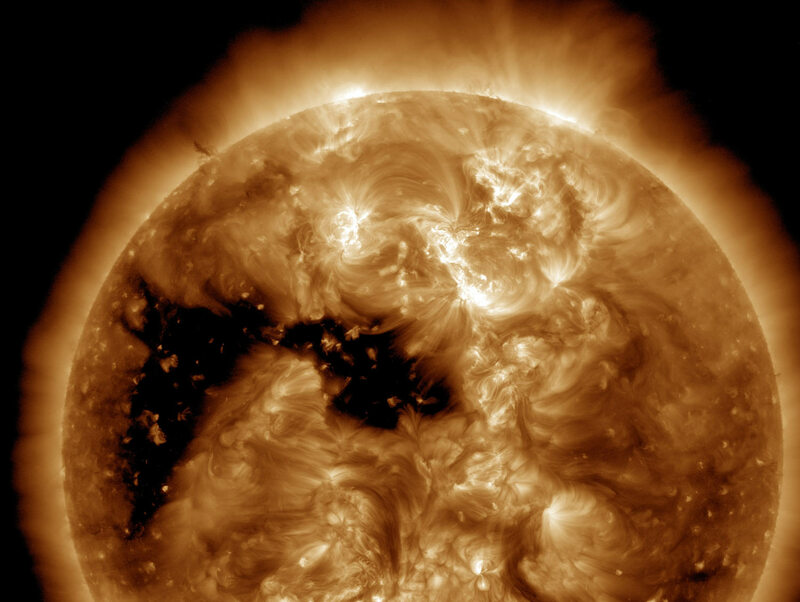 During high periods of solar activity, the sun flings off massive chunks of changed plasma which can severely damage technological infrastructure on Earth. Image Credit - NASA/SDO and the AIA, EVE, and HMI science teams. Importantly, modern scientists have something that observers decades ago did not – sophisticated satellite data and modelling that can forecast space weather with accuracy. ‘If space weather forecasting is inaccurate…space storms can result in disruption in the operation of satellites, interruptions of communication, incorrect navigation data from GPS satellites, force the rerouting of polar flight paths, or set up ground induced currents that can severely impact the operation of power grids and pipelines,’ said Professor Robertus von Fay-Siebenburgen, who headed up a project called PROGRESS at the University of Sheffield in the UK. Along with other scientists, he coordinated the work to improve the reliability of systems that predict space weather events by measuring the solar wind from distances further away from Earth than previously possible. Solar activity follows an 11-year cycle of high and low periods. Those high periods are when it is most likely for events like coronal mass ejections (CMEs) to occur, where the sun flings off massive bulks of charged plasma into space. These charged particles, when directed towards Earth, can impact in as soon as half a day’s time. Many times the first real warning can only come an hour before. ‘The consequences of space weather hazards can result in anything from a mild operational inconvenience to total loss of segments of our modern technological infrastructure,’ said Prof. von Fay- Siebenburgen. Solar storms have caused sea mines on Earth to explode and unusually bright northern lights in the past. Courtesy of NASA/SDO and the AIA, EVE, and HMI science teams. That’s where improved forecasts come in. ‘If we can successfully forecast the state of the solar wind at L1 (a point between the Earth and Sun where gravitation forces are equal) based on observations of the solar disk, we can increase this forecast horizon to about one day (in a worst-case scenario),’ he said. One way the project did this was by using more advanced computer modelling, instead of having to wait for observed results. Using machine learning to sift through data, computers can predict the level of geomagnetic activity due to the interaction of the solar wind with the terrestrial magnetic field, forecasting how particles travel between the magnetic field and radiation belts. For instance, what effect particles cause can depend greatly on the direction of a CME’s magnetic field. ‘Some of these particles may lose their energy to the atmosphere causing the aurora borealis/australis. Other particles can gain energy, thus posing a threat to the satellites orbiting in the vicinity of the radiation belts. Solar flares may emit intense bursts of X-rays that can penetrate deep into the ionosphere severely disrupting radio communications and navigation systems,’ Prof. von Fay- Siebenburgen said. He thinks that we still have a long way to go in improving forecasts, noting that a ground-based monitoring network or satellites positioned to the side of or behind the Sun relative to the Earth could lead to further improvements. Dr Richard Harrison at the Rutherford Appleton Laboratory in the UK is on a similar track. He and colleagues in a project called HELCATS, used a satellite set up to monitor the Sun and Earth from a side view, known as STEREO, to gather data on CMEs and how they vary in speed, density, and direction throughout a solar cycle. ‘The idea was to exploit the STEREO Heliospheric Imaging data, with observations of over 1000 CMEs from 2007 onwards, and apply the latest and best analysis and modelling techniques to investigate the identification, tracking, and prediction of CME events in the heliosphere,’ he said. By combining solar events seen from imaging with modelling, they were able to help improve predictions of arrival times on Earth by better understanding how CMEs interact with one another as they propagate outward from the Sun. ‘The HELCATS project is a resource for the research community. The catalogues will continue to be widely exploited and the assessment of the models has had a lasting impact on our approach to studies of Earth-impacting events,’ he said.